After fifteen plus years of working through enough ad agencies that have rendered AMCs Mad Men unwatchable for me—finding too much fact in their fiction—I was certain I had seen much of the drama there was to see in the world. Then I learned that right in the heart of Manhattan’s Upper West Side, a new Mafia had out a stake in the ground: The Nanny Mafia. And with that I about spit out my coffee. My C.N. (current nanny) now had my full attention. I’d heard stories from other moms about the territorial natural of some city nannies. 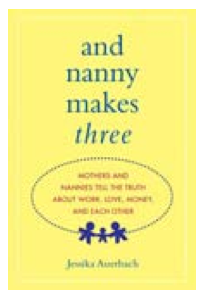 I’d read “And Nanny Makes Three: Mothers and Nannies Tell The Truth About Work, Love, Money, And Each Other by Jessika Auerbach a full discourse on the nutty stuff that happens between New York City nannies, working moms and stay at home moms, but a playground front off? This was epic. I didn’t tell my C.N. that I’d other moms had shared that rogue nannies would sometimes watch you with your kid, observe your natures and, if you seem pleasant enough, inquire about the family’s pay scale, offer their services, and if need be under cut the family’s current nanny, if they had one. After all, for nanny’s seeking out a new job could put your current gig in jeopardy. A slight of hand was needed. But I sensed, this was a different game. I nodded and slipped my now cold coffee. I wasn’t angry that she had told strangers Julia’s adopted. It’s an open fact. What pissed me off was the level of integration these women were leveling at my C.N. Now I was official shocked. “She’s black!” The shorter one said. A whole lot wasn’t right about this information shake down. But what fell into the positive column: C.N. had held her own. Although she stands at only 5’2”, a tiny woman that even wears an even tinier shoe, size five but she’s feisty with good instincts. About three weeks after the playground information shake down, last Tuesday, C.N. texted me at work. Nothing-unusual there. Happens a few times a day. But the content of her text? That was off the charts. But we saw Julia’s ex, there, at the reading. “What did Julia do.”? I said, then held my breath, silently praying. I knew the old nanny’s game. She wanted to shame the current nanny, make her feel she had lost control of her charge. Her status. That Julia was still connected to her. “What’s wrong,” Yvonne, my office mate, said from behind her massive black computer monitor. A silence landed in the office, collapsing all the oxygen. “Did she?” Yvonne asked. All I did know was this: when life puts more than two people together, complications can arise. From bad breakups to intimate working relationships that derail to office meltdowns— social schisms were a fact of life. What I hadn’t counted on was the rage I’d feel when it came to Julia, and our C.N., how I needed to know no harm would come to either one of them. I know the world can be a cruel place. What I didn’t know was how deep The Nanny Wars went. “You kind of scared me on the phone today, I never heard you mad before,” C.N. said as she slid on her jacket, at days end. After all the show is called Mad Men for a reason.